What if Pinocchio, upon becoming a real boy, realizes that the real world isn’t what he thought it would be? 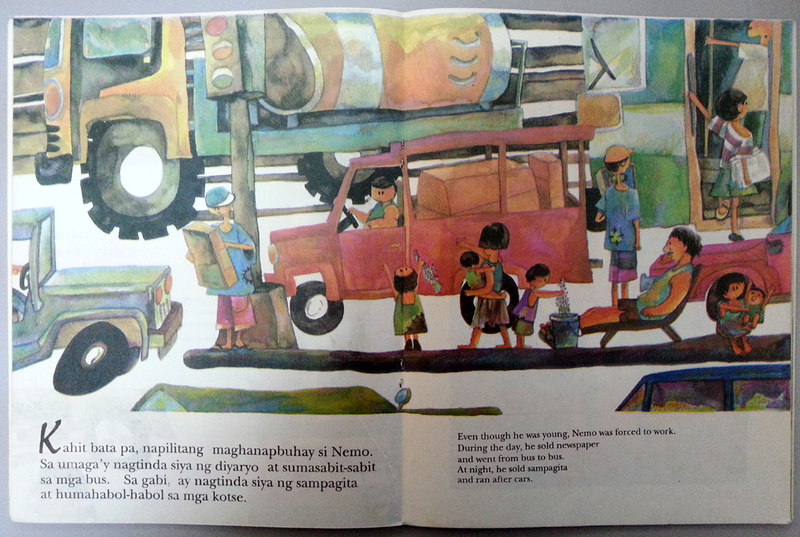 I cannot say for certain what inspired author Rene O. Villanueva to write Nemo, Ang Batang Papel. (For all I know, Sir Rene could have just been playing around with a story about a paper boy selling newspapers on the street!) 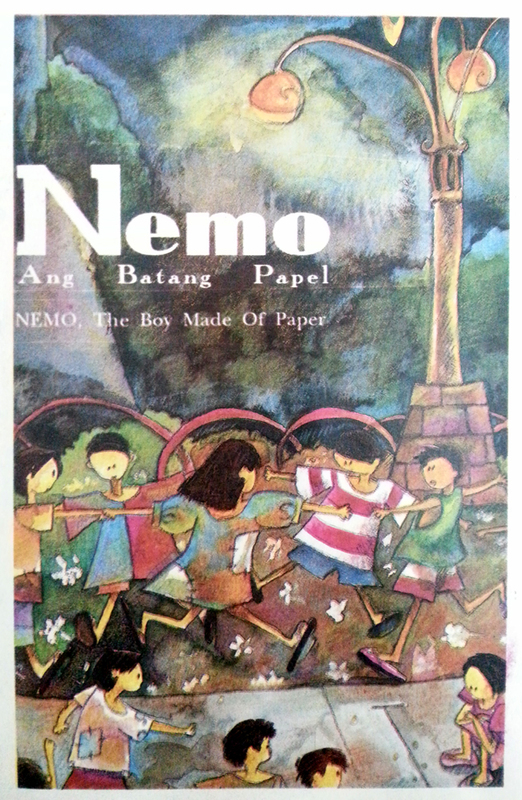 But Nemo does ring like an alternative Pinocchio: A boy, made out of paper, wishes that he becomes a real boy. His wish is granted, but his real world isn’t exactly what he wished for—real boy Nemo’s world is the world of indigent children, forced to work and support their families by selling items in the murky streets of the city. So they all become children made of paper, and the wind blows them all away. When I first read this story—there is no other way of putting it—my mind was seriously blown. I remember the exact circumstance: I was newly hired, and a student was asking for a copy of the story for his thesis, and I read the book while reproducing one of our file copies. (Should anyone need to clone me in the future, my DNA can be collected using left-over brain matter from our company photocopier.) WHAT IS THIS STORY TRYING TO SAY? The answer to that—or to be more precise, the multiple answers to that is exactly what brings this book to the top of my list. Because the immediate message can be this: some children will be better off if they are taken away from their current world—a message that further opens itself up to multiple other layers of meaning. It also says that when the world fails to recognize and provide a child what he needs, he will not experience a real childhood. It also tells children that some people are luckier than others, that we don’t always get what we want, that not all stories end well and some endings can even be ambiguous. My favorite interpretation of this book is from a teacher my husband told me about: “being made out of paper” is a metaphor for reading, so the story is actually an homage to the escape and fulfillment one can get from books. Just how beautiful is that? The great thing is, one doesn’t have to cherry pick from these interpretations, because all these are worthy of discussion even if the discussion will be something as simple as whether it’s okay for children’s books to have a non-happy ending. (Though it may not be that simple.) The only hesitation I have about this pick is that I have to wonder whether it is only the adult in me that appreciates the depth I found in this book, whether I would have liked this book if I had read it when I was young. But then I think, would that even matter? 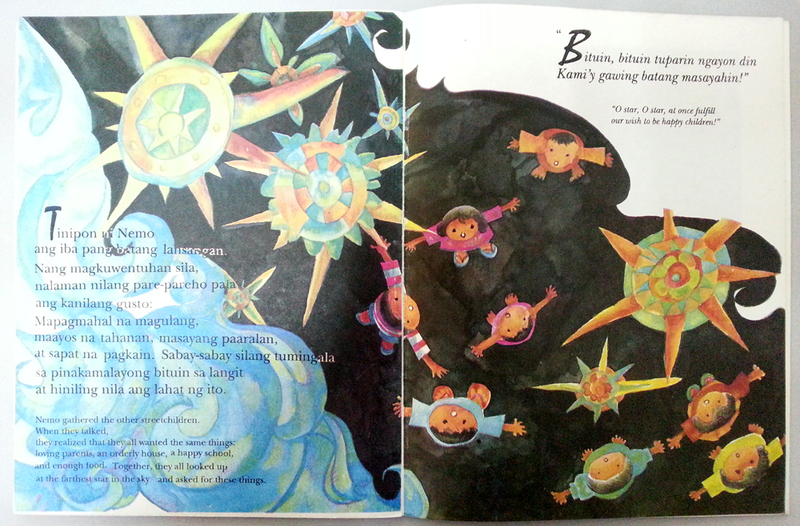 The point is that this book was created for children, in the hope and trust that they will find something of value in it. In this intent alone, I consider this book commendable. I know that this book was created by people who are driven by their belief in a child’s ability to think critically and without prejudice. In no way did this book condescend to kids in its storytelling, and it is a standard to which I hold all other books for kids. * Nemo, Ang Batang Papel is no longer in print but it will be included in Mga Kuwentong Adarna, a treasury of 35 classic and out-of-print titles from Adarna House. The treasury will be released in limited print this year. ** All images in this post are the property of, and are used with permission from, Adarna House. 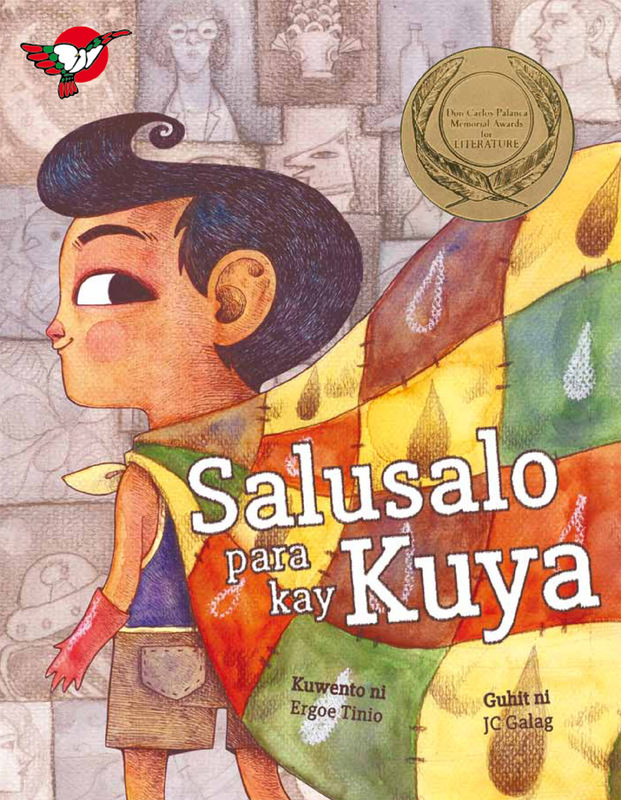 This blog post is done in participation with the National Children’s Book Day blog tour of the Philippine Board on Books for Young People (PBBY). NCBD is celebrated every third week of July to commemorate the anniversary of the publication of Jose Rizal’s “The Monkey and the Turtle” in Trubner’s Oriental Record in London. PBBY has organized a book summit on July 21 for this year’s celebrations. Visit the Facebook event page for details.